The Royal Army Medical Corps was formed in 1898 to properly provide medical facilities for soldiers on the battlefields. Many useful lessons had been learnt from the Boer War and the advance in medicine in the late Victorian and Edwardian periods meant that by 1914 the RAMC provided among the best medical facilities of any combattant nation in Europe. As the army expanded the RAMC likewise had to grow too and the most common form of RAMC unit during WW1 was the Field Ambulance. These consisted of 10 officers and 224 men who operated close to the battlefield providing immediate medical treatment for casualties being brought in from the areas where the fighting was taking place. At a Field Ambulance a wounded soldier would be treated, stabilised and assessed and most likely moved on to the next level of medical facility – usually a Casualty Clearing Station – by ambulance; either horse drawn or motorised. 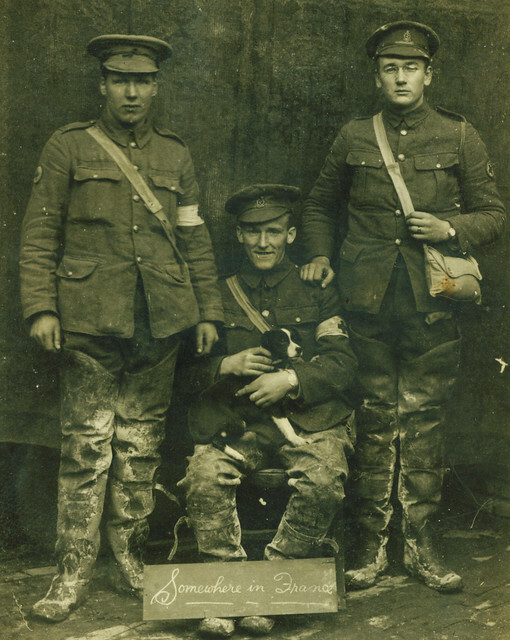 This image was taken on the Somme in late 1916 and shows three Stretcher Bearers of a Field Ambulance operating in the terrible conditions that prevailed during that period. The small haversacks they have are the bags containing their PH Helmet gas masks. The man on the left has a rain cover over his Service Dress cap – indicating how wet it was at the time – and all three have ‘trench waders‘. These were rubberised over trousers come boots which could be worn in flooded trenches. White Somme chalk is liberally plaster over the waders and one wonders what duties in the front line these men have just returned from? Carrying a stretcher was hard at the best of times but over wet ground and through flooded trenches was even harder and the smiles here no doubt bely some tough times during the hardest winter of the war on the British sector of the Western Front. This entry was posted on 19/03/2012 by sommecourt. It was filed under British Army, France, Great War, Hospital, Somme, Western Front, WW1 and was tagged with 1916, Medics, RAMC, Somme, WW1. My Grandfather was a Stretcher Bearer with 110th Field Ambulance RAMC 36th (Ulster) Division during WWI. This eventually led to me Joining the RAMC. My Grandad was in the RAMC at the battle of the Somme. I have a postcard which he sent from there to his sister, congratulating her on the birth of her baby. My Grandfather was stretcherbearer on The Somme 1916. Awarded the Military Medal when just 17 years old. Also at Passchendaele 1917. Followed the poet Edmund Blunden ‘over the top’ at The Somme . Both survived the war but were only Ghosts. Mere shadows of the men they once were. MY GRANDFATHER WAS ALSO WITH THE 110 FIELD AMBULANCE RAMC ,36 ULSTER. What about the poor dog he/she doesn’t get a mention!